Take your little one in a space exploration adventure and inspire him to learn more about the outer space with the Outer Space Peel and Stick Cut Outs. 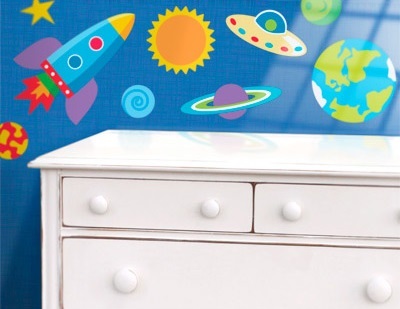 This set of Out of this World Peel and Stick Decal Cut Outs includes 2 decal sheets of everthing your kid needs to go into orbit! Each sheet has a decal of a rocket, sun, moon, star, green planet, red planet and blue astroid. 20 pieces in all. - Two sheets, each 12 inch x 12 inch. - Twenty pieces ranging in size from 8.5 inches to 2 inches. - Printed on amazing woven polyester fabric wall decal material, not inexpensive vinyl. - Repositionable - Put on, take off, rearrange! - Will not curl, shrink or wrinkle. - Even comes back to life if crumpled! - Sticks to most surfaces, even textures! - Easy to apply and easy to remove, no tools needed. - Made in New Hampshire, USA! - Peel off backing and apply to any smooth dry surface." - Peel off and stick to any dry surface. - Keep the backing sheet for storing the decals.